ASU Insight, Vol.27, Number 19. There's more to behold in a sliver of of paper than meets the eye, and ASU biologist Charles Kazilek can tell you all about it. 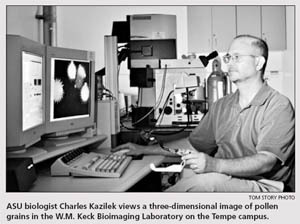 Kazilek, of ASU's School of Life Sciences, can see plant biology, chemistry, physics and history all weaving through the microscopic fibers of the thinnest of slivers of paper. His discerning eye and technical expertise recently earned him an award of fourth prize in Nikon's "Small World" competition for his photomicrograph of paper made out Lomandra longifolia, a native Australian grass. Kazilek also received an honorable mention in the Olympus Bioscapes Digital Imaging competition for his micrograph of paper made from another Australian plant, Cyprus eragrostis. The micrographs are just a small part of a substantial online gallery of pictures Kazilek has compiled in the "paper project." 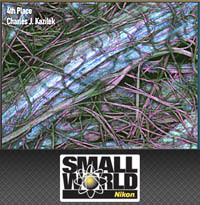 Through the use of a scanning 4-laser confocal microscope, Kazilek has revealed a detailed microscopic world. "The longer I have worked with paper, the more I have become enamored with it," he says. Kazilek has found innovative ways of incorporating features of the paper project into other creative projects. The paper images were incorporated into a dance piece in 2002 with the help of ASU choreographer Jennifer Tsukayama in which dancers weaved through three-dimensional projections of paper. There is also an exhibit based on the paper project at the Paper Discovery Center in Appleton, Wis., called "Fiberscapes: Experiencing Paper in 3D." The exhibit features a room with three-dimensional projections of magnified paper fibers where the visitors are transformed into the size of a period, Kazilek says. The paper project began in 1999 when ASU professor emeritus Gene Valentine went to Kazilek hoping he could tell him how some silk paper Valentine made was held together. The two have been working on the project ever since, revealing intricate detail of paper's structure. An important part of the paper project is the fact that it is a great educational resource for teachers. The Web site (http://paperproject. org) was awarded last year for having the best teacher education site by Multimedia Educational Resource for Learning and Online Teaching. The stunning pictures on the Web site help pull students into subjects like the hydrogen bonding that acts like a glue to hold the paper together or the types of plant cells that make up different kinds of paper, Kazilek says. The Web site also provides in formation about how to make paper with pictures of Valentine demonstrating the process. It also allows visitors to process confocal microscope datasets and make three-dimensional images using free software available on the Web site. Dan Jenk, with Media Relations, can be reached at (480) 965-9690 or (dan.jenk@asu.edu). Reprinted from front page article, ASU Insight, Vol.27, Number 19.